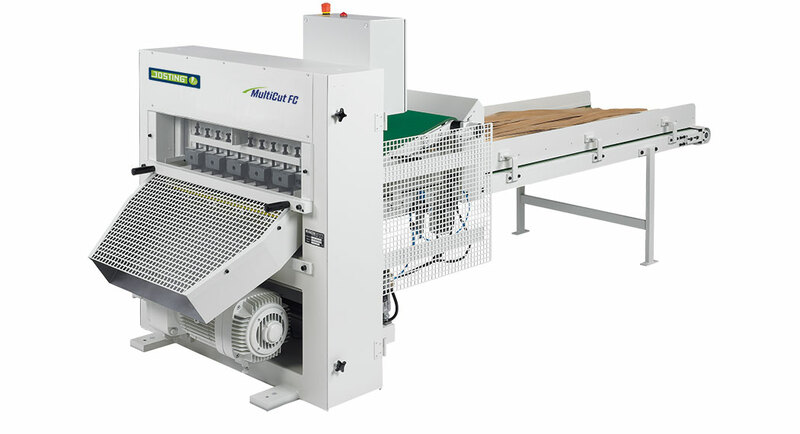 The Waste Chopper Josting MultiCut MC is a low-noise chopping machine for waste strips and pack trimmings. Veneer and other scrap produced in the course of cutting veneer to size can be put to profitable use as a heating fuel. Conventional rotary refuse grinders are unsuitable, however, for the chopping of veneer (high level of noise, veneer stripes become tangled). Machine loading and unloading can be adapted to the specific conditions of production. A vacuum extractor unit can be installed on the slide.Chopping reduces the volume of the waste by about half, i.e. chopped waste needs about 50 % less space for transporting and storage. It is an advantage to use a long feed conveyor to collect the veneer waste from several cutting machines. The chopping machine ’s conveyor can be lowered on request to enable near-floorlevel feeding. The waste is put on the chopping machine’s conveyor, which transports it to the cutting zone in stepping mode.Chopping is performed by a crossblade and 10 longitudinal blades working against a cutting bar in continuous up-and-down operation. The Waste Chopper MultiCut MC features a powerful knife drive system with brake motor, gearing and lateral crank drives. Hood guards prevent accidents, and a rupturing diaphragm device protects the machine from overloading. Speed of conveyor 1,1 m/min.